Today's mission is to declutter your mudroom, or other back entrance to your home, to make it a functional and useful place for your household. 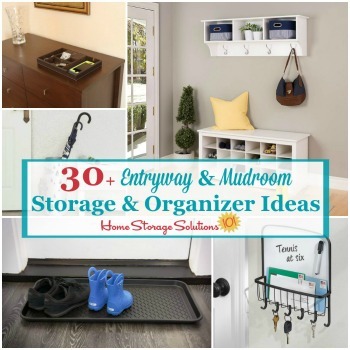 This mission is designed to be done while we work through the Mudroom & Entryway Organization Challenge here on the site, which is one of the 52 Week Organized Home Challenges, since the first part of organizing any space is to first declutter it. Of course, you can do this mission whenever you feel it's necessary for your home. Also, even if you don't have a mudroom, this mission also applies to any back entrance to your home, so it complements the mission earlier this week to declutter your front entryway to your home. In many ways decluttering your front entrance and back entrance of your home are similar (so if you haven't already, go ahead and check out the entryway decluttering article linked above for some general directions). 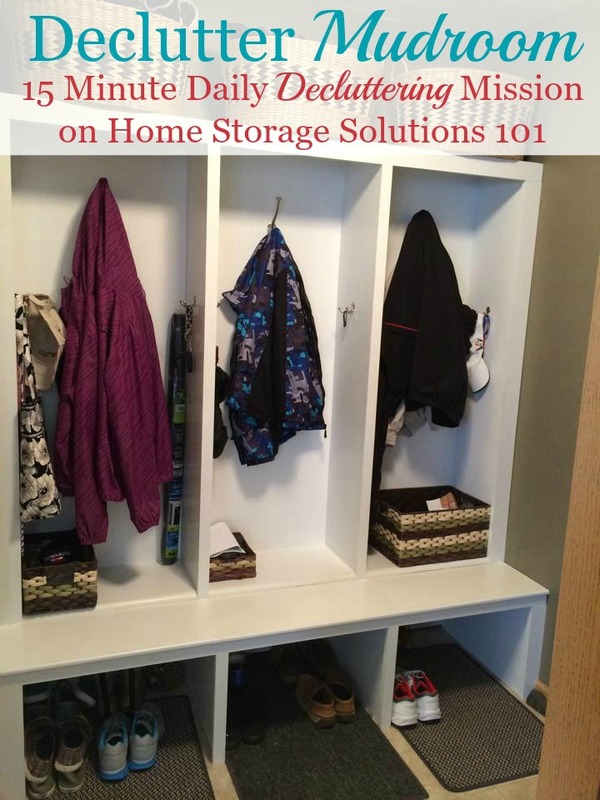 When decluttering your mudroom, first identify the functions of the space. For both the front and back entryway of your home that function by definition has to include giving people, both guests and household members, a clear path of access into or out of your home. Therefore, removing tripping hazards and things that people have to manuever around get in and out of the door is of paramount importance. Another function of this space is often that it's used as a temporary holding or storage area, so that people who come into your home have a place to take things off (like coats) or put things down (like bags) and leave them close to the door until they're ready to leave, at which time they pick them back up. I say this is often a function of the space, but not necessarily a function, because how much and what type of stuff you can hold or store in this space depends on how big it is. If you've got a huge mudroom, for example, definitely use it to its full advantage to help you store coats, or bookbags, or shoes and boots, or whatever else you want or need to put in there. However, if your mudroom is small obviously the less you can realistically fit into the space, and you'll need to think of other places in your home to hold some of this stuff, like a coat closet, or in a hallway, or elsewhere. The big difference when decluttering your front versus the back entrance of your home is that when decluttering the back entrance you don't have to be quite as concerned about accomodating guests. That's because, typically, guests are more likely to come in the front door. 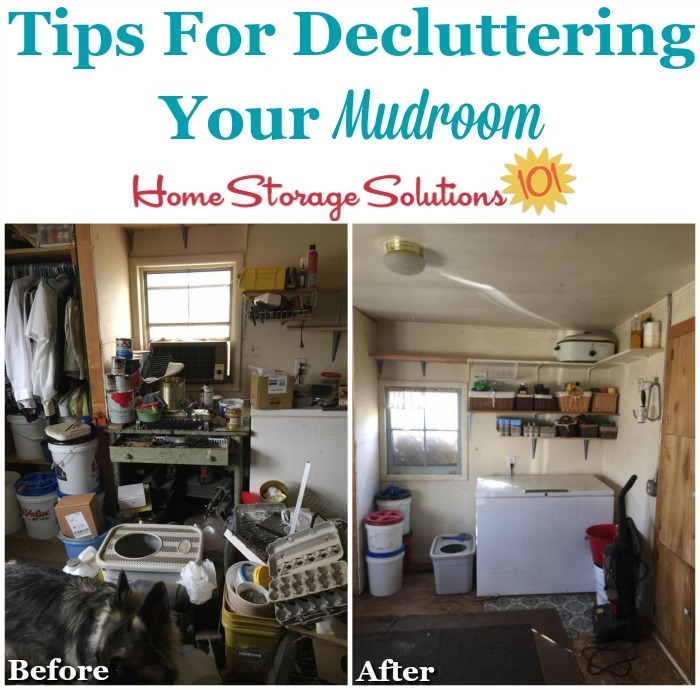 That means when decluttering your mudroom or back entrance you can focus more on making the space functional, without quite as much concern about how it looks from a home decorating standpoint. Of course, you still want it to be nice for you and your family's comfort, so make sure to check out these mudroom ideas on the sister site, Stain Removal 101, for 5 ways to keep it clean and inviting. In addition, for many people, if they've got a mudroom or back entrance it serves a dual purpose in the home, such as also functioning as a laundry room or utility room. If that's the case for you, make sure to think about the additional functions of the room as well, when deciding what should stay in the space versus what needs to go. 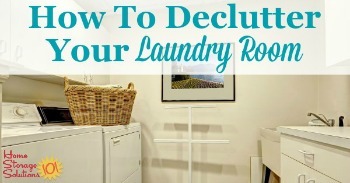 You can get more ideas for decluttering your laundry room here, if that applies to you. 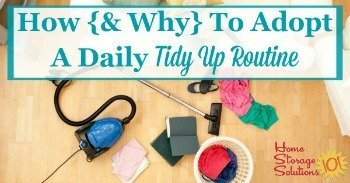 One thing you'll find is that even after clearing the clutter from your mudroom or back entrance is that clutter and mess will re-accumulate, as people use this space. That's completely natural and expected. 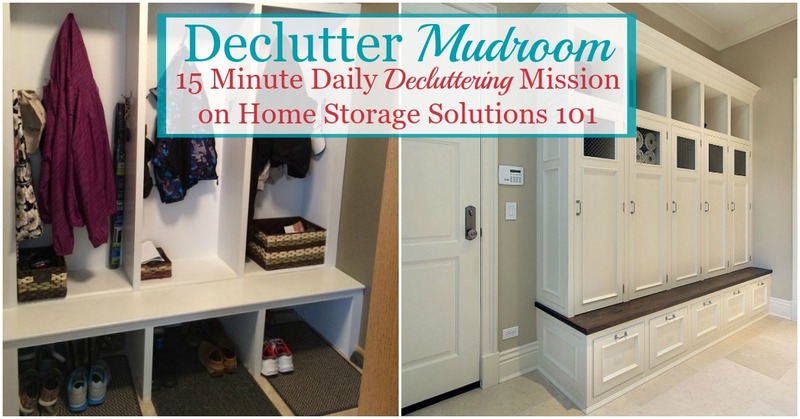 Decluttering your mudroom won't be easy, but it is definitely worth the effort! To help you get motivated to tackle this task for yourself, make sure to check out these before and after photos by fellow Declutter 365 participants who've already done this mission. First, here is a before and after photo from Kimmie, who said of the before photo, "Painting the furniture today and getting the ice fishing gear to its home. The mud room WILL be done." Later she also provided the after photo, and said of it, "Everything painted, distressed and an old cabinet on top with a ton of storage. Gotta paint a verse on front of cabinet but that can wait a few days. Now to tackle the desk and utilize that cabinet for paperwork, taxes, and keepable papers." In addition, here's another set of before and after photos, from another reader, Heather. 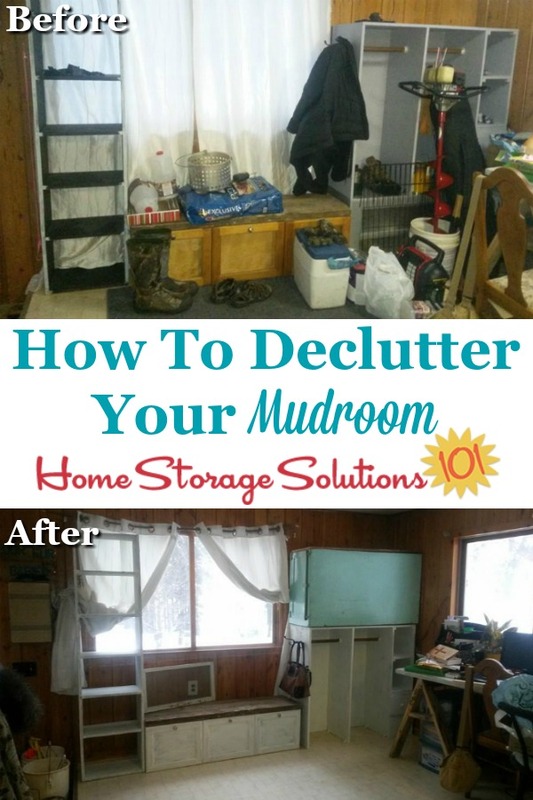 She said, "My mudroom/laundry room has been accumulating stuff for 30 years. Here is a before and after pic." It's quite a transformation, isn't it? Congratulations Heather, you did an amazing job! 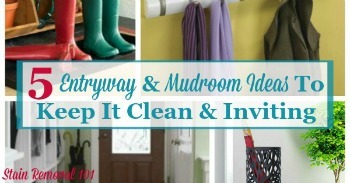 I hope seeing these pictures and instructions have inspired you to declutter the mudroom or back entrance into your home.